A rendering of Northwestern’s new biomedical research building by Chicago architecture firm Perkins+Will. Construction is scheduled to begin on the base of the building, on the site of the old Prentice Women’s Hospital, in 2015. Prentice Women’s Hospital tops a list of historic sites lost in 2013, according to a report released by the National Trust for Historic Preservation. The group is part of the Save Prentice Coalition, which lost its case to preserve the clover leaf-shaped building after the Commission on Chicago Landmarks denied it landmark status. Northwestern is currently demolishing the building and plans to replace it with a glass biomedical research facility connected to the Robert H. Lurie Comprehensive Cancer Center. “Prentice is on the list because I, personally — and the National Trust — was involved in it deeply because we advocated for the reuse of the building for a couple of years,” Christina Morris, field director of the National Trust for Historic Preservation, said. Morris worked in Chicago to try to save the building. Plans to create a new research center were more than a decade in the making, University spokesman Al Cubbage said. NU’s annual research expenditures have tripled to about $550 million in 20 years. The 1.2 million-square-foot building is scheduled to begin construction in 2015. NU selected Chicago firm Perkins+Will to design the building in December out of three finalists. The firm’s plans for the center effectively considered aesthetics and research purposes, Cubbage said. 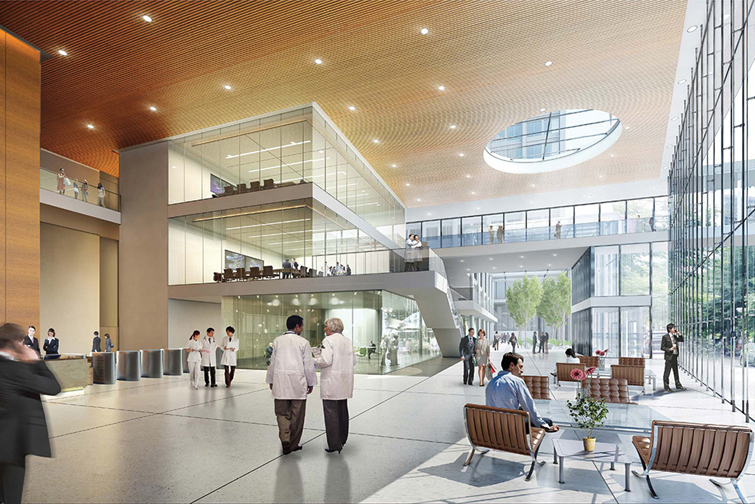 Perkins+Will designer Ralph Johnson said the hospital grounds would foster collaboration between researchers by including open space on the ground floor. The building’s design incorporates a shared lobby, lecture hall, cafe and winter garden. Construction on the building’s base and tower will be divided into two separate phases. Construction on the base will begin in early 2015 and cost $370 million, Cubbage said. The building’s tower will be completed by early 2019. University officials do not yet have a cost estimate for the latter phase. Approval to carry out demolition of Prentice came after the city repeatedly decided not to grant the building landmark status. Preservationists argued for the need to preserve the building in front of the Commission on Chicago Landmarks in November 2012 and February 2013. Both times, the city denied the hospital landmark status. Preservationists’ proposals to preserve Prentice Women’s Hospital while accommodating NU’s needs to expand research were dismissed by the University. Although the University’s plans to construct a biomedical research building have been known for years, Morris said NU did not indicate it would be demolishing Prentice until the last few years. Chicago architect Bertrand Goldberg designed Prentice, which was constructed in 1975. The hospital provided maternity services, nursing care and a psychiatry department. “I feel (the current design) is by no means as interesting and innovative as Prentice and certainly not as groundbreaking as Prentice was,” Morris said. Correction: The story previously stated the incorrect date for completion of construction. The construction of Prentice is scheduled to begin in 2015. The Daily regrets the error.